Reply to text messages in private. If you're like many professionals, you rely on your cell phone to stay connected with everyone from colleagues and clients to friends and family. In the workplace, however, it's best to put your phone away and keep texting to a minimum. If you spend more time staring at your phone than you do interacting with your coworkers, your boss may think your mind's not on your job. Placing or reading text messages during staff meetings, client meetings, business lunches or other work-related functions signals to others you're not interested in what's going on. Even if you try to be discreet, it's hard to miss one employee hunching over her cell phone when everyone else in the room is glued to the presentation. You're also more likely to miss important information and you won't notice the speaker's body language and other nonverbal signals. If you're waiting for an important text, or if you want to text someone about a topic related to the meeting, inform others. Saying "I'm waiting for a text from Mike in accounting" demonstrates that you respect the other people in the room. Texting at your desk is not nearly as disruptive as texting during a meeting, especially if you have your own cubicle or office. If your office has an open floor plan, seeing you huddling over your cell phone could distract coworkers, and they may hesitate to approach you if they have questions or need to discuss a project. Focusing on your phone instead of your surroundings creates a barrier between you and your colleagues, and you may miss out on important conversations because others feel unwelcome interrupting you. Not to mention your boss probably won't be happy if he catches you answering personal texts on the job. Even texting when you're not strictly on the job can be seen as inappropriate. 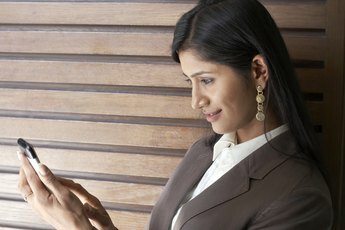 If you're in the elevator or break room or walking down the hall, you may see that as free time when you can check your text messages without taking time away from your job duties. However, you're still at work and anything you do at the office enhances or detracts from your professional image. If you're walking down the hall transfixed by your cell phone, others may view you as someone who's self-absorbed and not interested in anything else going on at the company. If you do you use your personal cell phone at work, turn off the ringer and text message alerts. 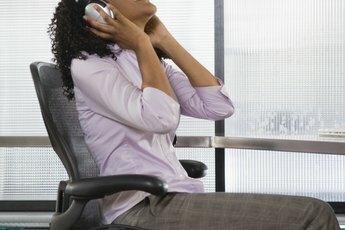 Hearing your phone beep every five minutes disrupts the atmosphere and prevents other employees from focusing on their duties. If you must read or place a text, excuse yourself and seek out a private area. If you have your own office, shut your door until you're done. 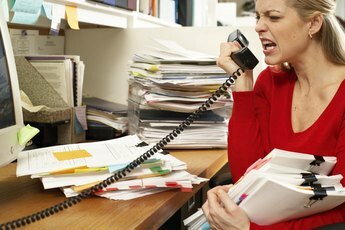 What Can I Do if the Cursing in My Workplace Upsets Me?